Simply fill out a few lines of info, upload photos of your damaged unit and we will do the rest. In less than 5 min of your time you can get a quote sent to your email with details on the cost of repair, actual repair time and cost for towing to our facility. At Fitzgerald Collision and Repair we aim to make your headache disappear. We work with all insurance companies, take care of the logistics and getting your damaged truck to our facility. Our repair times are faster then anyone in the country, we know downtime is a killer to your bottom line and we work hard to get your rig back out on the road as quickly as possible. We need at least 4 photos of your damaged unit. Taking one picture from all 4 corners of your truck is typically best, but the more photos you provide the better we can give you a more accurate quote. Photos should be good quality, taking them from a newer smart phone is sufficient. Make sure the lighting is good as photos taken at night will not work for our estimators. Try and get as much of the truck in the photos as possible. If you suspect rear frame damage please include a few detailed photos showing the damage. Fast and Accurate quotes: What you want to know. How can we give an accurate quote just off of a few pictures? Our team of estimators here at FCR have extensive experience with Freightliner Cascadia and Coronado trucks. There is not much we haven’t seen when it comes to collision damage. We will give you a high and low estimate with details explaining what can cause your truck to be on the high or low end of the estimate. In some cases our team may ask for additional photos to more accurately complete a quote. What if it costs more than the original quote? 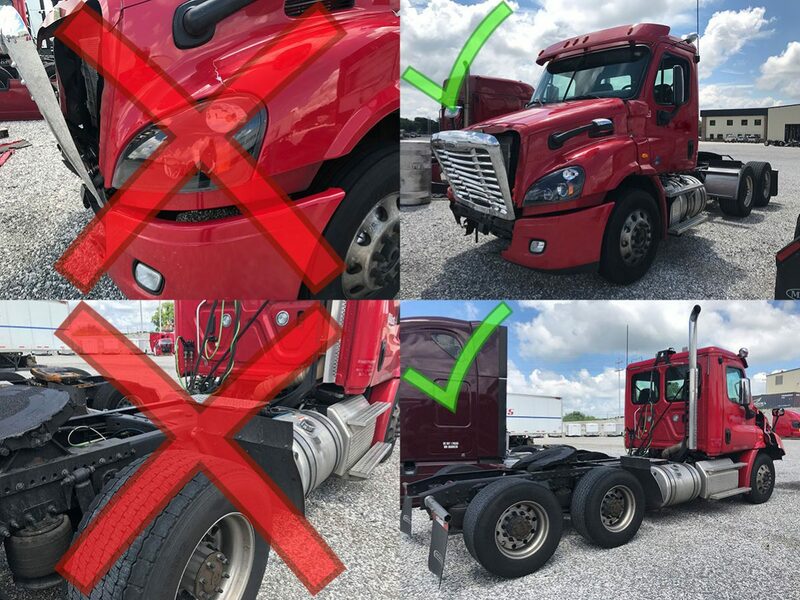 If there is any discrepancies in the original quote we generally will know this within a few hours of receiving your truck and will inform you immediately before the repair work is started. How soon can you get started and when will I receive my truck back? In most cases we will start the repair process the day your truck arrives, typically light damage trucks are completed with in 48hrs and heavy damage around 7 to 10 days. How are you able to complete the work so fast? Do you cut corners to finish in such a fast timeline? The number one reason we can get your truck repaired so quickly is our team! FCR has the best group of specialized guys and girls who only perform work on Freightliner products. We also have the largest inventory of replacement parts in the country allowing us to get the job done without waiting on parts to ship to us.